A century ago, people would’ve scoffed at the prospect of drinking from a promotional paper cup (or paper cup of any description!). Mind you, walking on the moon and journeying to the bottom of the ocean were also pie in the sky endeavours. But filling a vessel made of paper and not expecting a soaking was beyond their thinking. Even as a child, I remember my grandparents refusing to drink tea from anything less than a fine bone china mug, such was their entrenched attitude. What they would have made of a swarm of commuters swigging their must-have caffeine fix from paper cups, in public, while walking, would have made for interesting dinner conversation. Best they’re no longer around to witness that and many other changes in society. As business owners and team leaders in organisations, this is a breakthrough we should endorse and encourage. Why? Well, for no other reason other than the massive opportunities to brand our concerns on small moving billboards. We have a customer who supplies all the paper cups for community sporting events in their state “for free” because they get cost-effecting advertising. Are you running an event in the foreseeable future? 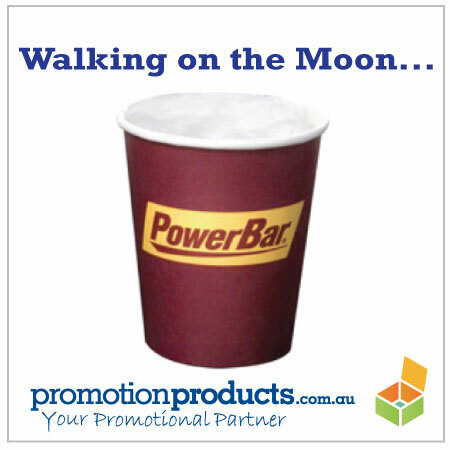 Whether it’s a conference or trade show or even just a BBQ in the park for clients, the cost effective option of printing promotional paper cups and their mass distribution will spread your message far and wide. The print and style options available to forward thinking people charged with promoting a venture, make promotional paper cups a necessary part of your strategy. And, who knows WHAT the future will bring – perhaps the “invisible cup” complete with branded, patterned coffee crema…..actullly, that’s rather a good one! This entry was posted in Fun and Leisure, Giveaways, Outdoor Products, Promotional Products and tagged catering, giveaways, hipster, outdoors, restaurant by admin. Bookmark the permalink.